To commemorate World Refugee Day, celebrated each year on June 20th, AWID spoke to Yasmine Flitti, Director of Finance and Administration with Comede (Committee for the Health of Exiles)1 and Hélène Rama Niang Diagne, President and Founder of FECSDA (Women Education Culture Health and Development in Africa)2, to learn more about the issues and challenges of migration in the Mediterranean region from a feminist perspective. Refugees and asylum seekers are protected under the 1951 Geneva Convention and State signatories to the convention have a commitment to provide protection to those fleeing persecution and violence. Over the past two years there has been an alarming increase in the number of recorded missing or murdered migrants in the Mediterranean – 3,500 in 2014 and 1,776 during the first four months of 2015, averaging one death every two hours. The number of missing or murdered migrants reported between January and April 2015 is thirty times greater than during the same period in 2014. European States have played a key role in this crisis, “By organizing media campaigns announcing massive unprecedented and unending immigration, and by supporting a culture of fear to justify their murderous policies, they have failed to propose any viable political, economic or humane solutions.” While human trafficking from Africa to Europe is a problem, “By launching military operations against human traffickers4, European States are offering us an analysis that fails to recognize the closing of legal channels for entering Europe and creating rights-free zones that favor the influx of mafia networks, which is well understood as something that needs to be combatted with force,” explains Flitti. These policies that impede the population flow between the Mediterranean shores are contrary to Article 13 of the Universal Declaration of Human Rights that stipulates everyone has the right to freedom of movement. If the media seems to have extensively covered the crisis, the coverage has focused primarily on men. “Women are largely invisible; they appear on the contours of an image of a makeshift boat, with or without children, but less in number than the men. Even knowing that the European migration flux is largely feminized, we have little information on women’s migration across the Mediterranean. This to me reflects what little is made of the situation of migrant women in particular,” says Flitti. And once the precarious administrative process and obstacles to obtaining the right to asylum, or to residency are over, when entering the workforce, these women largely find themselves in caretaking roles (childcare, patient care, elder care, maintenance/cleaning); and education level has little to do with employment as diplomas they have earned in their country of origin are rarely recognized. Niang Diagne adds that migrant women are victims of “all the challenges associated with their status, living conditions, roles and responsibilities as women,” including marginalization, violence and abuse against women and girls and the violation of their bodily and moral rights. 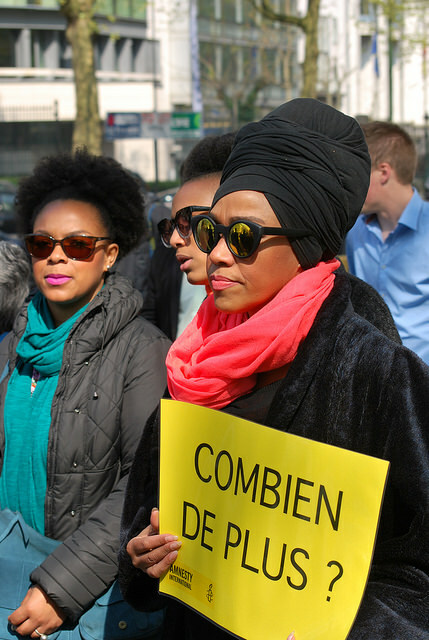 1 Comede is an organization aimed at supporting the health of exiles and defending their rights in France. 2 FECSDA works toward gender equality in accessing political, economic, social and cultural rights and the development of children, young women and women by cultivating positive values from within and outside of Africa toward social transformation and endogenous sustainable development. 3 There is no existing legal definition related to migrants. 4 On 18th May 2015 the EU Council decided to put into effect a naval military operation, EU Navfor Med, “to break the business model of smugglers and traffickers of people in the Mediterranean”. This military action would have serious consequences for migrants now faced with multiple risks as well as possibly increase instability in Libya. 5 The January 2015 attacks in France correspond to a series of terrorist attacks exerted over three days (7-9 January 2015) against the satirical magazine Charlie Hebdo, the polices and a kosher supermarket. Twenty people died following these attacks (including three terrorists) and a dozen others were injured.